Spin This: "Money Changes Everything," "Girls Just Want to Have Fun," "All Through the Night," "Time After Time"
A classic album restored digitally; 2-CD set features demos, 12" mix and previously unreleased material. 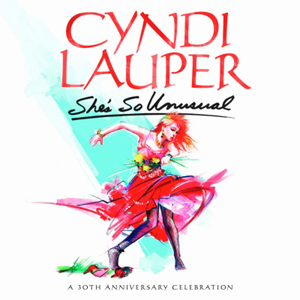 On the digitally-remastered 30th anniversary disc, “Girl Just Want to Have Fun” is given a rave-inducing makeover from Yolanda Be Cool, which focuses on snippets from Lauper’s original vocal (“you gonna live your life right,” they just wanna, they just wanna”) and the sing-a-long-chorus. It’s hardly complete, which only means it’s good as dancefloor filler. It’s hard to believe that NERVO and Bent Collective (Denny Verde, Steve Redant) had the ballsy idea of turning “Time After Time” into dance mixes. Gay crowds will smile over these inclusions, especially the seven-minute, tribal-pumped Bent Collective mix, but the synthpop patchwork of these tunes isn’t ever going to replace the beauty of Lauper’s original. For celebrative purposes, these 21st century inclusions seem justifiable. But for those seeking for a more complete and authentic tribute, one should turn their attention to the double-disc deluxe edition, which contains 12-inch mixes from the era (like the Arthur Baker remix of “She-Bop”), demos, a B-side from “Girls Just Want to Have Fun” (“Right Train, Wrong Track”) and previously unreleased material made during the She’s So Unusual sessions.